"Sing to Him a new song; play skillfully, and shout for joy." Jason and Declan (2 years old and minus a shoe!) share a moment of worship and praise after the Sunday evening service. This is what I call a "kiss from the King!" Sweet MOMS, I want to invite you to study God's Word online with me. For 21 years I have been writing and teaching a Bible study for MOMS. 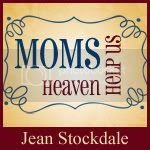 On September 17, I am beginning a my new series for MOMS on the Book of Ephesians called "High Stepping in Heavenly Places." Using personal illustrations to teach Biblical principles, I will be sharing God's Word with practical applications and large doses of sanctified humor. For the first time, we are going to offer an online study for MOMS. If this sounds like something you might be interested in, please check back on Monday for more details. In the meantime, download one of my PODCAST messages on Philippians to get acquainted with my style of teaching. I hope for an opportunity to instruct you and encourage you in the Word of God! Please invite all your MOMMY friends. From moms with toddlers to teens to turning loose adult children, I am inviting you to grab a Bible and a pen and join us online for a MOMS Bible study!! Blessings. Now for more Word Filled Wednesday click here. Our hostess this week is Penny Raine. Leave her a comment and thank her for creating another opportunity for us to share God's Word online! And stop back by my blog on Friday to play 5 Things Friday with me. This week is 5 of Your Favorite Things. Post photos or use your words to describe 5 of Your Favorite Things. We are delighted to welcome Sagemont Church in Houston,Texas to our MOMS family at Standing Near the Cross Ministries. Sagemont will be doing our 10-week Bible study called "Mirror, Mirror, on the Wall"in their Mothering Matters Women's Ministry starting September 15, 2009. I wrote this study for MOMS on the Book of James. Whether you have a toddler or a teen, this study is for you. From diapers all the way through to diplomas, my Bible studies address all stages of mothering-even releasing adult children! Through this practical study you will learn how to deal with anger, how to use your words to bless and not bruise, and how to deal with difficult days. Laced with large doses of sanctified humor and personal illustration, I will teach you how to apply Biblical truth to the awesome, but daunting, task of mothering. One MOM who completed the study wrote this: The lives you have blessed through your teaching and Bible studies are immeasurable. I am changed, as a wife & momma, because your teachings have done more than prick my heart, they have called me to a higher standard--a higher calling--and while challenging me, your words have also encouraged me to press in & press on. To God be the glory! Sagemont Churchis located at 11300 S. Sam Houston Pkwy. East in Houston, Texas. The church's phone number is 281.481.8770. Mothering Matters meets from 9:00-11:30 on Tuesday mornings and is open to all MOMS in the community. Click here for registration information. Or contact Karen King at 281.992.9832 or at gsking@swbell.net for more information. MOMS, this is a great way to connect with other women in the trenches of mothering. If you live anywhere in the Houston area, please consider joining the MOMS at Sagemont for a time of sweet fellowship, instruction, encouragement and fellowship with other MOMS. Podcast. Are You Kidding Me?!?!? PODCASTING. Seriously. I have been teaching Bible study for MOMS for the last 20 years. My sons were 8 and 10 when I started. They are 30 and 28 now! When I began teaching MOMS I had no idea that this is what the Lord had for me to do with my life (beyond the whole wife and mom deal-I was sure THAT was His perfect will for my life-but this . . . who knew?) but teaching MOMS has become the driving passion of my life! I teach MOMS every week (Sept.-Nov. and Jan.-Mar.) at Bellevue Baptist Church. If you live ANYWHERE in the Memphis area, please come and join us. We have a wonderful time on Thursday mornings at 9:30! For information go to www.believe.org and click on Women's Ministry. We have a nursery for the wee ones and we are offering a program for home-school kiddos. Seriously, you don't want to miss out on this! We will learn how to deal with the angry monster (in your life and in your children), we will learn how stop screaming at your kids (its okay-we all resort to it every once in a while), and we will learn how to use our words to affirm our family as well as how to honor and respect our husbands. And then we eat lunch. Because we work up quite an appetite learning all that stuff! I can hear you now. You are making plans to join us even as we speak. But what, you ask, if you cannot attend. You don't live near Memphis. Or you work. Or you just had a baby and the idea of getting the baby dressed and you dressed at the same time is seriously out of the question. Good news. I have good PODCASTING news for you! The messages will be broadcast on a live video feed every Thursday at 10:45 CST, starting on Thursday September 17th. And, more good news. if you cannot join us on-line, the messages are achieved at the same spot. This year I am teaching on the Book of Ephesians. The study is called High Stepping in Heavenly Places. Would you like to learn how to live this faith thing out? Would you like to learn how faith looks in real life, flesh and blood, nasty now and now, with a houseful of ornery kids with their own ideas of whose in charge? Well, join us. On-line. And, more good news. If you would like the accompanying Bible study workbook, that will cost you $15.00 plus shipping and handling at my website www.jeanstockdale.com. Check it out and we will get that baby in the mail to you ASAP. You could even get you a bunch of your girlie girl MOMMY friends together and do it as an on-line group and meet one night a week while daddy watches the kiddos! I'm just saying! Now, what if you can't join us at Bellevue and you can't watch the message on-line, then what? Well sisters, guess what? We are going to PODCAST the messages. That's right. PODCAST. We have got the computer program necessary and the directions and as soon as Ray and I can figure this baby out, well . . . we are going to PODCAST my Bible studies from this here blog. I think (hope, really really hope) we will have the PODCAST up and running within a week, although this from a person who does not know how to do a thing but write on the computer, but I have PEOPLE. PEOPLE who know how to do stuff. Techie stuff. So . . . if Ray and I cannot get the silly thing to work, we are going to call in our people. So, keep checking back. And tell you MOMMY friends. Tell them to join us right here at this blog for a healthy dose of sanctified humor, practical advice of faith-walking as a mom, profound TRUTH from the Word of God, the added benefit of some funny stories from my crazy life. And who doesn't like funny?!?! Now in order to try to start this up immediately (within this week) we are going to start by PODCASTING my study on Philippians called Joy in the Journey. Who doesn't like JOY! Every MOM needs some JOY in her life. So starting soon, you can click here and follow the directions to PODCAST and hear the 10-week series called Joy in the Journey, a Bible study for MOMS. If you would like to buy the 192-page workbook to go with the Bible study, go to www.jeanstockdale.com and we will set you up for $15.00 plus shipping and handling. Please tell all your MOM friends to stop by and get some JOY 'cuz, sister girlfriend, we are PODCASTING. That's what I'm talking about . . . PODCASTING. Now, one more thing. If you would use this service, would you please leave me a comment and tell me. That would be so greatly appreciated! Blessings. My Nest is Empty; My Heart is Full to Overflowing! My 2 boys are grown and married now. Each one has a son of their own they are raising. There is nothing quite as sweet to this mom's heart than to see my sons raising sons!! Here are 5 Things I Wish I Had Known When I Was Raising My Children. 1. My boys would end up being good friends. My boys were 2 years apart and I wondered if they would ever get along! As it turns out, they ARE good friends. They actually work together in a family business. They go to chruch together and their families regularly fellowship together. They have grown to appreciate their differences and celebrate the things they share in common! 2. How to maintain my balance. Balance has never been my strong suit. I tend to "over do" somethings and totally neglect others. I wish I had the eternal perspective I have gained through many years of walking with the Lord when my boys were young. It would have helped me keep my spiritual equilbrium and balance my priorities better. 3. Not to buy much. Children do not really need alot of physcical things. They much prefer your attention over more STUFF! Clutter is the bane of every mother. I wish I had bought fewer toys, fewer clothes, fewer things that needed to be dusted! Before you buy something you think you (or your children) cannot live without, just think - when you are sick of it and try to sell it at a garage sale, someone will ask you if you will take a quarter for it! Do you really need it? 4. My boys would end up eating a wide variety of foods. Who knew? As adults they developed tastes for all kinds of foods they would never even try when they lived at my house. Hmmm.....the wives might have had something to do with that and GOOD FOR THEM! 5. My boys would love the Lord in their adult lives and build their own households of faith. For ever Christian mom this is HUGE. This is the thing we long for, but we are always wondering if we are passing down a living faith or raising a prodigal. This decision ultimately falls to them to decide to receive or reject Jesus Christ. But let's face it, there is much we can do that will affect their decision. I do wish I had prayed more, fasted more often, memorized more Scritpure AND rested in the Lord MORE OFTEN when they were younger. This are 5 THINGS I WISH I HAD KNOWN WHEN MY CHILDREN WERE YOUNGER. **The powerful storms that lashed Memphis over the weekend took out our internet and phones. Sorry to be AWOL from the blogosphere for a few days. Jason, our oldest son, has always loved music. From the time he was young, he like music. Loud music. All kinds of music. When he was 18 he asked for a guitar for Christmas. He did not play but he loved music. Lots of music. Loud music. And he thought he might like to learn to play guitar. Loud guitar. So Craig and I bought him a guitar. Oh, and an amp. You need am amp if you are going to play LOUD. So we bought one and he loved it. Loved it. For several years Jason tinkered with the guitar. He picked up a few things from friends who played, but he never took lessons. Then he married. I assumed the guitar would be packed away but Jason kept it around and continued to teach himself. Five years later a son joined their little family. Guitar playing took a back seat as the sweet wonder of a baby boy named Declan consumed their time and energy. Fast forward 1 year. Jason and Daws, his younger brother, had been stirred up by the Lord for over 2 years about working with a church plant. Two weeks ago the vision became a reality as the Lord birthed theRefuge, a new church plant in Lakeland, TN. outside Memphis. The boys invited Craig and I to visit their first Sunday night service. Jason told us he was playing guitar in the praise and worship band. And he was loving it. Seriously.I had no idea he had progressed to that point! Two weeks ago we sat in a worship service. Jason led in worship, playing the guitar we had bought him 7 years earlier because he like music. Loud music. This past Sunday we visited again in their evening service. I watched my son, the one who wanted a guitar for Christmas 7 years ago, sing praises to the Lord and lead in worship with the praise band at the Refuge. It took my breath away. The Lord and I shared a private moment as I told Him that I never dreamed He would use my son's love of music for His glory. When Craig and I had bought the guitar,Craig felt we couldn't give Jason a guitar without giving him the amp. Especially since he loved music. Loud music. We bought the Christmas gift for Jas but we really did not think he would ever have time to master it, much less play publicly. He was about to head off to college and we knew the busiest time of his life was just ahead. We could not see him having time to learn to play an instrument. We were grateful for the privilege of indulging one of his desires especially as he was perched to leave our nest and launch out on his own. But we did not know. We did not know what God knew was in his future. One day God would use Jason's love of music for His glory. One day Jason would lead praise and worship with the Christmas guitar. And the amp. One day I would sit in the congregation next to his dad and tears would stream down our faces as we thought back to the day we bought the guitar. We did not know what God in mind for our son. One day he would lead praise and worship with our Christmas gift. And suddenly all those years when his loud music rattled the walls and shook the rafters would melt away into a moment of praise the the Lord Jesus Christ. God often startles me when He uses what I consider mundane moments and shows me the holiness in them. And then He allowed me to see this . . . seriously, is this my son? Yes. This is my son with his son, Declan. Declan came out of the nursery to hear his daddy. While I generally have words, lots of words, at this moment I am speechless. For more Wordful Wednesday click here and join in the fun. Blessings. I have 2 grandsons. Declan is 2 years old and Grayson is 1 year. For the first time in a long time, I have little ones crawling, walking barefoot, wallowing, worming, squirming, playing, and/or laying on my kitchen floor. Now I am in no way obsessive about keeping a clean house. To let you think otherwise would be misleading. But I am concerned about what our Baby Grands are exposed to while visiting at our house. Toddlers put things in their mouths. Things that have been on the floor. Toys. Fingers. Food. Whatever. So I have began to rethink what I clean with. I have rediscovered the value of vinegar for all-around cleaning. VInegar Works For Me. It is all natural. It is cheap. It does a great job and it eliminates the concern for harsh chemicals. This WORKS FOR ME. This cleaning "recipe" is from a site called Vinegar Tips which gives about a million ways to use vinegar. Check it out. Get a shining finish on a no-wax vinyl or linoleum floor by cleaning it with a solution of one cup white distilled vinegar for every gallon of water. By the way, I have raised 2 little boys into men. Great men. Godly men. Great husbands. Fabulous daddies. Little boys are the only raw material God uses to build men. And He uses MOMS (just like me and you) in the process. Stunning, I know. Desperate, dysfunctional, damaged MOMS like me to raise children. Moms, like me, that quickly discovered I was in way over my head trying to raise children, and was left with no other option than to cast myself upon the grace of the Lord Jesus Christ. And He has been FAITHFUL. "Even when we are faithless, He remains faithful for He cannot deny Himself." FAITHFUL. God is faithful. Having said that, MOMS, can I give you a word of advice? DO NOT TRADE A PERFECTLY CLEAN HOUSE (OR THE PURSUIT OF IT) IN THE EXCHANGE FOR TIME WITH YOU KIDDOS. Little ones grow up very fast. Investing in a house (or anything else for that matter) is a poor trade-off. While my own boys were young, we had a saying around our house. "We are raising boys, not a house." I am not encouraging you to be slothful or lazy or neglectful. Homes must be maintained. But character must be built. Fun must be had. Memories must be made. Games must be played. Books must be read aloud. The love of the Lord Jesus Christ must be displayed in your (an mine) flawed humanity redeemed by grace. Otherwise, you are silently communicating the great value you place on your home, your reputation as a perfect mom, the pursuit of perfectionism, your value of possessions over people, and/or your need to meet unrealistic expectations. Sweet MOMS, step away from the sink. Put down the vacuum. Don't dust today. Grab some books. Gather your flock. Sit on the floor and play for a while. When your little guys ask, "Mom, what is up with this?" Give them a hug and tell 'em its a gift from ME. That, is what WORKS FOR ME! I am launching a carnival on Friday called "Five Things Friday." Each week I write about 5 Things I Wish I Had Known When My Children Were Small. Please join me on Friday and play along. Want some more WORKS FOR ME WEDNESDAY. Click here and go to We Are THAT Family. Welcome to this week’s edition of Aloha Friday. Welcome to this week’s edition of Aloha Friday. In Hawaii, Aloha Friday is the day that we take it easy and look forward to the weekend. So I thought that on Fridays I would take it easy on posting, too. Therefore, I’ll ask a simple question for you to answer. Nothing that requires a lengthy response. I have 2 grown sons. They are married and have babies of their own. How fun it that? Anyways, I am not currently in the "active phase of mothering." Obviously I am still a MOM to Jason and Dawson, but I am not "mothering them." Adult children, by the way, do not want to be mothered! Can I get a AMEN? If you continue to mother an adult child you will convey to them that you do not believe they can think for themselves and make wise decisions. Although I am not currently mothering anybody, I do write Bible studies for MOMS. I am always interested in finding fresh ways to minister to them. I believe mothering is a holy occupation but I think it is a hard job!! It tends to be thankless much of the time. The weight of the constant guilt and the disappointment of unmet expectations don't help one bit! I loved mothering. It as one of the most fun things I have gotten to do with my life, but even I will admit it was just plain hard work! Highly rewarding, but hard work! So . . . I would like to pose this question to you. What are the 3 hardest things about being a MOM? For more thought provoking questions, check out Island Life by clicking here. Most of you know that I have been teaching a Bible study of MOMS for the last 20 years. Since 2006 I have published seven, that's right, seven of my Bible studies and produced DVDs to accompany the studies. In September I will begin a new series on Ephesians called "High Stepping in Heavenly Places." As I approach this awesomely fabulously fun, but very daunting, task I am well aware of the rapidly changing social climate we are living in. Not to be melodramatic (although you got to know that I am not opposed to me some drama), but I declare I have never seen anything like the world we are living in. I certainly feel called to teach God's Word and exhort, encourage, and instruct MOMS with His TRUTH, I do not want to become irrelevant. I intend to remain conservative in my doctrine and refuse to change the message. However, I want to stay socially relevant. Frankly, that is getting harder and harder for me! There is a narrow path here and I don't want to wobble off into the ditch on either side. So, my darling little internet bloggy mommies, I am turning to you in my hour of need. I NEED some feedback. Whether you are a momma or not, a Christian or not, active in your church or not I need to hear from you. Whether you are a working mom, a stay-at-home mom, a homeschooling mom, a brand new mommy or a grandmother, I would like to hear from you. Any female is welcome to respond. You may answer anonymously or email me at jean@standingnearthecross.com if you do not want you insight to be publicly shared. Give me some help here. Tell me what you need. 1. What would I need to offer to you to make you drop everything and attend my study? I need to know what it would take to make you faithfully attend every week (for 10 weeks) and refuse to miss. What would you need in a program for that to be true? 2. What elements do you need from a BIble study that would cause you to be motivated to DO it? How can I motivate you to DO what I am teaching you? 3. Would you attend if my program was only available at night? Could you arrange for your own child care if we hosted it in the evening? 4. Especially if you are a home-school mom or a working mom, would you really be interested in committing to a 10-week evening program? Would you do the homework (about 1.5 hours a week)? Would you be willing to go to a study after a long day of work? 4a. If you are a home-school mom, what would need to be for your children (give me some ide of the age ranges) offered to get you to set this time aside each week and attend? Would you be willing to pay for these services? How much per child would be reasonable? 5. What cost would be appropriate for a Bible study workbook and program? 6. Would you pay for childcare if offered? How much per child for a 2.5 hour event? 7. What topics would you want to be taught (or do you think are relevant for MOMS today)? 8. Do you enjoy the dynamics of a small group setting? What do you like (your favorite part) or dislike (the thing you cannot stand) about small groups? 9. What would you be looking for in a small group leader? 10. As the writer and teacher of these studies, what could I do that would make this study more meaningful to you? 11. What other insight do you want to share? 12. I want a program that is so extraordinary that MOMS are frantic to register and come. Considering the cultural climate, what kind of advertising could I do to reach MOMS outside my own church that would COMPEL them to come, even if they were not a member of my church or unchurched? I am not looking to write one more study and teach one more session. The body of CHrist has enough studies. What we don't have is enough women living it out on a daily basis. I want to know some fresh ways to promote the program. I am looking for ways to reach into the unchurched and unbelieving community. I want to reach single moms and working moms and ALL MOMMAS with the gloriously good news that God loves us and He is able to help us MOMS raise up the next generation for HIs glory! Now, you may just put your answers in a paragraph form and not answer every question individually. You may skip some of the questions. I meant to only ask 3 questions and here I am . . . a short epistle later, still going and going. So help a sister out and give me some insight ASAP (or anytime over the next 4 weeks or so). Pray for me as I seek to reach the tired, the weary, the disheartened, the worn-out, the overwhelmed, and the MOMMIES of this world for the cause of Christ! I have just finished a project. I have written a Bible study for MOMS on the book of Ephesians. For months I have been writing day and night, night and day. Some weeks I wrote 7 days a week to meet my deadline. The manuscript is 192 pages. It is a 8.5 x 11 workbook style book. It has 67,579 words. It is the work of my hands. It is the expression of my heart. And it is finished. It is safely in the hands of the publisher and will be released in August. I have always struggled with procrastination. I am one who can come up with great ideas but I lacked the follow-through. I am easily distracted. I like to sit on the couch and drink Diet Coke. I like to ponder the issues of life. All this has made my propensity to procrastination problematic. When I became a Christian, I wanted to serve the Lord. I wanted to follow after Him with passion and urge others to join me in the aggressive pursuit of personal holiness and practical righteousness. This heart's desire was at odds with my natural tendency to procrastinate. It is evidence of God's work in me that I am able to overcome my natural bent and stay on task to finish a project. The completed manuscript is not one of my finer things; God's work in my life IS! For more Finer Things Friday, click here. I was so blessed that both my daughter-laws sent out thank-you notes to the guests at the grandbabies' birthday parties. Patti designed these adorable cards to mail out on Delcan's behalf. Declan, lover of all things TRAIN, had a Thomas the Train birthday party for his second birthday. Oh does that child love him some Thomas the Train! This is him in his Thomas the Train p.j.s that Ray-Ray and Roy gave him. Trains. He loves 'em. Declan IS exceptionally bright, yes ma'am he is, but he is not writing just yet. So his momma sent this cute card out to thank his guests for his wonderful birthday presents. There are lots of ways to sent thank-you notes in this electronic age. I love what Kathryn did. Kathryn sent out email thank-yous to each guest with a picture of Grayson, who just turned one, playing with the gift. How cute is that? Love, love, love it! Moms, teach your children to be thankful and gracious. Good manners seem to be going out of style and I, for one, think that is a shame. Teach your children to be thankful. An ungrateful spirit leads to a sense of entitlement, which is an unpleasant character trait in a child and a seriously destructive trait in an adult. Teach your little ones at an early age to be thankful. Helping mom send thank-you notes is one really great way to do just that! And while I am on the subject, both of the moms had the little guys open their presents after their guests left. This seems like a really GOOD idea to me. That way, little 3, 4, and 5 years olds are not sitting there watching the birthday child open a stack of presents, unhappy that they are not getting any gifts. Just a thought, but I thought it was a thoughtful touch. So get out those thank-you notes and express some gratitude! Blessings. Dawson and Grayson gave it a try. Baby Gray was less than impressed. Declan checked out the baby pool. Grayson liked it better too. And then came the cake! JJ and Poppa love you. So do mom and dad. Daws and Kathryn, you guys are doing a great job on "training up this little guy in the way he should go." God bless you all. And Happy Birthday, Baby Grayson. You are loved! I don't have the time to write all the details, but we have gotten word that we have a group doing our Bible studies for MOMS in Uganda!! You want to talk about a GOD thing! Sisters, this is a GOD thing. Our GOD is BIG! Details forthcoming. Craig and I, and Roy and Ray are at the Southern Baptist Convention. We got to hear David Platt preach tonight. May I just say, God came down and met with His people. The hair is still standing up on the back of my neck!! Tomorrow we will be exhibiting my ministry to MOMS to the pastors' wives. 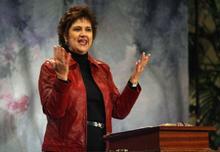 They Pastors' Wives luncheon has sold 1700 tickets and have an additional 100 seats added. At the back of the room about 50 ministries to WOMEN are being showcased. We are not selling anything. We are networking and handing out brochures (thanks Ray, Craig, Darlin' Darlene, and Stef for folding, cutting, sticking, and stuffing them for me!!) about the ministry, Bible studies, DVDs, CDs, and speaking. My greatest fear to is promote SELF. Sisters, for 30 years I have trying to keep self crucified. Please pray that we will not promote SELF but we will exalt Christ and His KINGDOM! Please pray Ephesians 1:18-22 AND 3:20-21 for us. We will be meeting with the pastors' wives at 11:00 Eastern Time (SPOILER ALERT-Time change, Jean. Yes, I have my watch set on Louisville time). Then a luncheon follows. Please pray for the favor of God to be upon this ministry, for self to be crucified and for Jesus to be glorified. I will keep you posted. Blessings. In Paul’s day, the care of prisoners fell to families and friends and not the state. It was up to the prisoners to enlist help. Paul had no visible means of support. He was cast wholly on the Lord and the kindness of His people. The Philippians had sent Paul financial support on several occasions. One of the purposes of Paul’s letter was to thank the congregation for their generous and timely gift. Paul’s letter was full of heartfelt gratitude and spiritual instruction. The Philippian church had ministered to his physical needs. In turn, Paul ministered to their spiritual needs. I. A Generous Gift-Philippians 4:10 Paul was grateful for financial gift Epaphroditus delivered and for the love it represented. The sacrificial financial assistance represented the Philippians’ love for the Lord and for His servant, Paul. Because the gift was based on their spiritual relationship in the Lord, their material gift was an occasion for Christian joy. The believers at Philippi shared a unique bond in the Lord with the apostle Paul. He had personally led many of them to the Lord. He had planted the church there. He had invested in them through preaching, teaching, and disciple making. He considered them his joy and crown, his riches and his reward (Phil. 4:1). The finances gift represented the riches in Christ they all shared. It touched a responsive chord of praise in his soul. Paul praised God for His gracious provision through the Philippian believers. Paul rejoiced in the Lord greatly (Phil. 4:1). Apparently, some time had elapsed between gifts from the Philippian church. Paul was aware that the passage of time did not represent a lack of interest, but a lack of opportunity. Paul wrote, Now at last you have revived your concern for me; indeed, you were concerned before, but you lacked opportunity (Phil. 4:10). This sentence sounds a bit like a rebuke but Bible commentators do not think it was meant to be. Perhaps a better translation might be, “You have renewed your concern for me because you have been concerned.” Bible commentators believe this is more along the lines of Paul’s intention. The Philippians had been concerned all along and had wanted to respond, but because of Paul’s situation, they had not been able to get aid to him. The church created an opportunity to send financial aid to Paul. Epaphroditus would be the courier of the gift. Travel in this day was very difficult. No lodging was available. Transporting food was a problem. Safety issues were a constant concern. Robbery was a common occurrence as travelers ventured through isolated areas. With little or no security patrols, muggings often escalated to murder. Epaphroditus would be traveling with a cash gift, making him an especially vulnerable target. Furthermore, contact with a prisoner of Rome was dangerous. Paul was considered a conspirator against Nero. Anyone who provided help to Paul was in danger of falling under suspicion. Association with Paul was risky at best. The sacrificial financial gift represented only a part of the gift; the danger Epaphroditus risked to deliver the gift was equally significant. II. A Contented Convert-Philippians 4:11-13 Paul was grateful for the gift. It caused him to rejoice in the Lord for His supernatural provision. However, he wanted to make it very clear. His joy was not dependant on financial aid from the Philippians or any other source. Paul had learned to be content in whatever circumstances he found himself. Contentment is learned through experience. Paul had learned to live in complete detachment from his circumstances. Paul reckoned the circumstances of his life to have been ordered by the Lord. Consequently, he fared well in and through them because of his own relationship to Christ. Paul had experienced prosperity and he had known poverty. Because he considered God to be in control of the circumstances of his life, his soul was at rest regardless of the prevailing situations of life. Paul could rise above any set of circumstances and prosper spiritually. Why? Paul wrote, I can do all things through Him who strengthens me (Phil. 4:13).Christ strengthened him. As Paul sought to live in the center of God’s will, he could rest in God’s power, provision, and providence. Please notice. This verse, often lifted out of context, is a conditional promise. The promise of God’s power is limited to the sphere of His will. Paul was content. In poverty or in prosperity, Paul was content. In prison or in the pulpit, Paul was content. Full or famished, Paul was content. III. A Satisfied Soul-Philippians 4:14-23 Paul was grateful for the financial relief that the Philippians had sent. However, he was not seeking a gift. His contentment was in Christ. Still, Paul was very aware of the value of the sacrificial gift - not to his account, but to the balance sheet of eternal rewards laid up in heaven for the Philippians. Paul wrote, I seek for the profit which increases to your account (Phil. 4:17). The love gift would serve to meet Paul’s needs, but it would accrue heavenly interest and eternal rewards for the Philippian Christians at the Judgment Seat of Christ. Paul knew the members of the Philippian church were not wealthy. The size of the gift represented sacrificial giving. Paul was humbled by their sacrifice but he was well aware it was impossible to out give God. Out of His limitless treasury, God would supply the need of these who had given with liberty. God’s sufficient supply through the Philippians’ gift caused Paul’s thoughts to linger on God’s glory and grace, prompting a doxology. Now to our God and Father be the glory forever and ever. Amen. Greetings were sent to the Philippians from all those with Paul, especially those of Caesar’s household. What divine irony. Paul’s imprisonment for preaching the gospel had lead to the furtherance of the gospel in Caesar’s very own household! Paul was satisfied, amply supplied, with the Philippians’ gift. Beyond that, his soul was satisfied with Jesus. I cannot help but think that Jesus was satisfied with Paul! I trust your soul is satisfied with Jesus. May you walk with The Lord Jesus Christ as a fragrant aroma, an acceptable sacrifice, well-pleasing to God. May you enjoy His endless supply of Joy in the Journey. Today is our last lesson on the Book of Philippians entitled "Joy in the Journey." For a live video feed or to view archived messages go to www.bellevue.org. We will begin the MOMS MINISTRY in September. Please join us then to study the Book of Ephesians. Jean's current writing and speaking schedule has kept her away from her daily posts on the blog. Please check back in next week when she promises to return. She misses you all terribly! To purchase Bible study workbooks or further information on Jean's ministry go to www.jeanstockdale.com. Sign up for her newsletter while you are there. The Philippian church held a special place of affection the Paul’s heart. He wrote, It is only right for me to feel this way about you all, because I have you in my heart, since both in my imprisonment and in the defense and confirmation of the gospel, you all are partakers of grace with me. For God is my witness, how I long for you all with the affection of Christ Jesus. (Phi. 1:7-8). Throughout his letter, Paul affirmed his love for them and the spiritual delight he felt for their forward progress with the Lord. But Paul was aware of a problem in the assembly of believers in Philippi. Sadly, there was a fly in the ointment! I. A Word of Affirmation-Philippians 4:1 Paul longed to see his Philippian friends and co-laborers in the faith. He was homesick for them. In his mind’s eye, he could picture his dear friends and recall sweet times of shared fellowship. John wrote, You too may have fellowship with us; indeed our fellowship is the Father, and with His Son Jesus Christ (I John 1:3). Sweet memories of the Philippian flock flood Paul’s soul, bringing joy to his heart and encouragement to his weary soul. Paul wrote, Therefore, my beloved brethren whom I long to see, my joy and crown, in this way stand firm in the Lord, my beloved (Phil. 4:1). Like a father proudly considering the godly maturity of his child, Paul reflected on the spiritual growth of the body of Christ in Philippi and it brought great delight to him. Paul writes, You are my joy and crown. In this way stand firm in the Lord. Paul knew God was at work among the Philippian believers. It is God who is at work in you, both to will and to work for His good pleasure (Phil. 2:13). But he also knew that they had chosen to cooperate with God’s purposes and plans in order for eternal work to be accomplished in their midst. It spoke to the maturity of the Philippian church and it produced joy in the apostle’s heart. Eternal rewards were laid up for Paul because of the Philippian congregation. They would prove to his crown in glory. A crown that the apostle would gladly cast at the nail-scarred feet of Jesus! So, Philippian church, keep standing firm in the Lord! II. A Fly in the Ointment-Philippians 4:2-5 Solomon wrote, Dead flies make a perfumer’s oil stink, so a little foolishness is weightier than wisdom and honor (Ecc. 10:1). That is, when dead flies are discovered floating in a vat of perfumed oil, the whole batch is ruined! Dead flies give, even a vat of concentrated perfumer’s oil, a bad smell! And it only takes one or two flies in the ointment to spoil the sweet fragrance of the perfume and most is worthless. Likewise, in the body of Christ, one or two malcontents can spoil the fellowship and stink up the place! In the midst of the sweet aroma of a united fellowship, striving to fulfill the purposes and plans of God, a fly can spoil the ointment! Division among believers spoils intimacy in fellowship, shakes the faith of new converts, damages the cause of Christ to the unbelieving world, and breaks the heart of God. At the church of Philippi, Paul was aware of a fly in the ointment. Epaphroditus brought word to Paul of the conflict between two women in the congregation, Euodia and Syntyche. Paul urged the two women to reconcile their differences and live in harmony in the Lord (Phil. 4:2). Can you imagine what it felt like to be one of these two women? In a letter that contained no rebukes, no correction of doctrinal error, or reprimand for moral failure, in a letter that consists of positive encouragement to press on in the Lord, in a letter intended to be read publicly to the congregation, can you imagine? Can you imagine hearing your name announced as one of the two flies in the ointment that was spoiling the fragrance of Christian harmony? Just how much was holding on to that grudge worth to those two women? We do not know the details of the disagreement but I don’t think it was worth what it cost them. Mercifully, the reference to Euodia and Syntyche was brief. Much was left unsaid causing me to fear that the details were well known to the congregation. Paul’s gentle plea for unity is immediately tied to joy. These two women had lost the joy of Jesus. Rejoice in the Lord always; again I will say, rejoice! Let your gentle spirit be known to all men. The Lord is near! (Phil. 4:4-5). The joy of the Lord produces a gentle spirit. Joy. Gentleness. Fruits of the Holy Spirit. That is the testimony the Christian world should be known for, not bickering and in-fighting! Watch us live at www.bellevue.org today at 10:45 CT or later in the Archived Messages for MOMS Spring 2009-"Joy in the Journey" A Joyeous Look at the Book of Philippians. Most Bible commentators consider the apostle Paul the greatest Christian whom has ever lived. Paul’s assessment of his own Christian life was much more humble. Paul would have summarized this season in his walk with Christ this way, “I have not already attainted spiritual maturity, so I press on.” From the moment of his encounter with the resurrected Lord of Glory, Paul was a new dramatically changed. Once the dread of the fledgling new church, Paul had terrorized believers. Paul, full of righteous rage, delighted to cast Christians in prison for their testimony for Christ. Paul attended the stoning death of Stephen and rejoiced to see the martyr’s blood run in the gutter. But all that changed. In an instant. In a moment of time. One glimpse of Jesus stripped Paul of all the religious ritual, pious pretense, and generational guarantees of God’s favor he was banking on. His Damascus Road encounter with Christ left him blinded and reeling from a glimpse of the Shekinah Glory of the Lord of All. In short order, Paul, the newly commissioned convert began an explosive ministry. Paul managed to stir up so much opposition in Damascus that he was forced to flee the city (Acts 9:25). While awaiting God’s direction in Arabia, Paul evangelized Arabia, Tarsus, and Cilicia before moving over to Syrian Antioch. He evangelized the island of Cyprus and founded a string of churches in Galatia. He championed the cause of Christian liberty and helped the elders of the Jerusalem church understand the covenant standing of Gentile believers. Paul described Gentile believers as wild olives, (who) were grated in among them and became partaker with them (that is the Jews) of the rich root of the olive tree (Rom. 11:17- parenthesis mine). Paul pioneered the work in Europe. He evangelized Ephesus and planted a church that was greatly used of the Lord to plant other churches in western Asia Minor. After years of fruitful ministry as a traveling evangelist, Paul found himself imprisoned in Rome for preaching the gospel. Chained to a Roman guard, the apostle turned his prison into a pulpit and continued to win converts in the ranks of the imperial guard and opening the door for the gospel into Caesar’s own palace. Yet Paul wrote, “I have not achieved spiritual maturity. However, I press on” (my paraphrase of Phil. 3:12). I. The Pursuit of Personal Holiness-Philippians 3:12-14 God had mightily used the apostle Paul to enlarge the reach of the kingdom. However, the work was barely begun. Paul’s intention was to view his calling as if nothing at all had been done. His new plan was to put the past resolutely behind him and sets his sights on the work ahead. Paul wrote, Not that I have already obtained it or have already become perfect, but I press on so that I may lay hold that for which also I was laid hold of by Christ Jesus (Phil. 3:12). Paul set the past in proper perspective. The sins Paul had committed were under the blood. That is, Paul could get past his past (the sins committed prior to his conversion and those sins committed after).He we willing to receive the forgiveness Jesus Christ was freely bestowing (see Romans 3:25-26). Paul also saw his accomplishments through his Father’s eyes. Everything of eternal value Paul had been able to do, he saw as God’s power in him. He recognized that God was accomplishing His purposes through Paul’s yielded life and obedient heart. Like an athlete stretching forward to win the prize, Paul was following after Christ. Paul was competing, not against other Christians, but against himself. Striving to crucify the flesh, cast down the vain imaginations lobbed into his mind by the devil, and cut off the lure of the world Paul wanted to lay aside every encumbrance and sin and run the race set before him, with his eyes fixed on Jesus (See Hebrews 12:1-3). The prize was Christ-likeness, personal holiness, and practical righteousness. He was pursuing the ever-deepening knowledge of Christ – not for salvation but for sanctification. The goal was to lay hold of that for which Christ Jesus laid him hold of him. Press on, beloved Christian. Press on! Run well. Finish strong. Stretch out toward the finish line and run. Press on, beloved Christian. Press on! II. The Acknowledgement of Spiritual Immaturity-Philippians 3:15-16 Paul recognized not every one was going to line up with him on every point. “Let as many as are perfect, have this attitude,” Paul wrote (Phil. 3:15). Many of Paul’s contemporaries disliked him, feared his brilliant mind, resented his success, feared his zeal and passion, and resisted his message. Paul was not threatened by their disapproval or frightened by their disdain. Paul was not willing to engage them in debate and he was certainly not interested in becoming embroiled in futile arguments. Paul warned Timothy not to wrangle about words, which is useless and leads to ruin of the hearers (2 Tim. 2:14). Paul refused to lose his joy over those who were not making forward progress in their walk with God. God was perfectly capable of revealing error to those who were either baby believers, or misled and deceived, or poorly discipled in doctrinal truth. Paul was content to follow after Christ. And he encouraged his readers to continue to press on with the Lord. Paul wrote, Let us keep living by the same standard to which we have attainted (Phil. 3:16).Press on, beloved child of God. Press on! III. The Reminder of Future Glorification-Philippians 3:17-21 Paul did not consider himself perfect but he was willing to take on the divine responsibility of being a role model of one who loved the Lord Jesus Christ. He urged his readers to observe those who walk according to the pattern of godly men and women (Phil. 3:17). Paul reminded his readers of the reality of false brethrens, who were ruled by all that is in the world, the lust of the flesh and the lust of the eyes and boastful pride of life (See 1 John 2:16). These false teachers masqueraded as believers to bring dissension and division into the body of Christ. There are many enemies of the cross of Christ, there are also many solid models for us to observe. Paul’s reminder of our future glory is enough to lift our thoughts from the misery and mire of this mortal world and cause us to fix our eyes on the heavenlies (Col. 3:1-3). The Lord Jesus Christ will transform the body of our humble state into conformity with the body f His glory. In light of that, beloved, press on. Press on! To watch live video stream of this message,click here. The message is live on Thursday, April 2, 2009 at 10:45 CT and then archived at www.bellevue.org under MOMS Spring 2009 "Joy in the Journey". We will soon be posting podcasts of this series on this blog. Blessings. In Christ Alone, I Stand! As a young Hebrew student Paul’s hunger for knowledge combined with his strict standards had caused him to rapidly rise to the top of his class. Paul had excelled at his religious education, showing early signs of genius. He verbally sparred with his peers and handily outshone their meager performances with his razor sharp rhetoric and nearly photographic memory. He had rightfully won bragging rights over all the other students. The bright Jewish scholar brought his parents no small measure of pride when he went off to Jerusalem to sit under the tutelage of the renowned Jewish rabbi, Gamaliel. Paul, born a full-bloodied Jew of the tribe of Benjamin, from a child was thoroughly grounded in the Scriptures. His parents recognized the early signs of genius in their son. They carefully guided their gifted child and relished the brilliant future their son had ahead of him. His home life, his schooling, his accomplishments, his passion, his position were all part and parcel of the components to groom Paul for a coveted seat on the Sanhedrin, the Jewish ruling counsel. That is, until that moment. In a blinding flash Paul was intercepted by the resurrected Lord of Glory on the Damascus Road. I. Religious Gains-Philippians 3:3-6 Prior to his conversion, Paul had vigorously pursued a life that conformed to the letter of the Jewish Law. That is, using his human giftedness, his acute mental capacity, and his ironclad willpower Paul had achieved greatness according to man’s standard. If anyone had reason to believe he could gain favor with God through human effort it was the apostle Paul. Paul wrote, If anyone else has a mind to put confidence in the flesh, I far more. No one had scaled such heights of religious ritual. He was born of the tribe of Benjamin, a Hebrew of Hebrews; as to the Law, a Pharisee; as to zeal, a persecutor of the church; as to the righteousness which is in the Law, found blameless (Phil. 3:4-8). On the human level, Paul could boast about his Jewishness. No one could have bested Paul in his national, tribal, or parental claim to his Jewish heritage. None could approach Paul’s zeal and enthusiasm for garnering religious (self-made) righteousness. A brilliant mind. A skilled orator. A learned scholar. A Hebrew of Hebrews. Paul was rapidly climbing the ladder of the Jewish hierarchy to rule the Sanhedrin. Paul’s rehearsal of his Jewish pedigree was directed at the Judaizers who mistook their strict religiousness for righteousness. Relying on a works-based manmade righteousness, they believed sinful man could find favor with God through good works, religious ritual, and strict adherence to the Law. The pretense of such heresy is laughable, knowing the sinfulness of unregenerate man and the fallacy of the flesh. In Paul’s day the rabbis were adding their interpretations and traditions to the Scriptures. As these oral teachings began to be written down, the Talmud emerged and nearly eclipsed the Torah! Piror to Paul’s conversion he too had been immersed in Jewish traditions and religious rituals. But then he met Jesus. Paul’s encounter with Christ revealed the inadequacies of man’s futile attempt to gain God’s favor by works of righteousness. Salvation is in Christ alone. Beware of what I call “pretty flesh.” Human effort clothed in religious activity by a believer or an unbeliever is little more than an attempt to disguise the flesh and make it presentable. When we rely on natural gifting, sheer willpower, or pretense “to perform” and appear to possess an acceptable measure of spirituality, we are controlling the flesh with the flesh. This exercise results in strengthening the flesh. Believers are to crucify the flesh and surrender to the Savior. II. Spiritual Liabilities-Philippians 3:7 Prior to his conversion, Paul had been captured by the self-effort of a religious system, which was never intended to produce righteousness. He was relying on his personal Jewish pedigree, his religious education, and his good works to gain God’s favor and secure entrance into heaven. Paul’s manufactured religious gains had turned into a spiritual liability. His religious rituals had dulled his senses, masqueraded his sinfulness with self-righteousness, and blinded him to his spiritual bankruptcy and his desperate need for a Savior. Religion had gotten between his soul and the Savior. Then he met Jesus. One glimpse of the Lord Jesus Christ and all of Paul’s self-righteousness turned into filthy rags in his sight. Taking account of his religious balance sheet Paul’s wrote, Whatever things were gain to me, those things I have counted as loss for the sake of Christ (Phil. 3:7). Paul realized his religious gains were spiritual liabilities. He was religious, but lost. Morally upright, but spiritually bankrupt. Still dead in his trespasses and sins. Upon meeting Jesus, Paul discarded his synthetic self-made religious ritual for the substitutionary sacrificial death of Jesus Christ. An honorable standing before men based on self-righteousness could not compete with a perfect standing before God based on the finished work of the cross! Whatever things were gain are all lost to me for the sake of Jesus Christ! In Christ alone I stand! III. Intentional Losses-Philippians 3:8-11 Paul wrote, More than that, I count all things to be loss in view of the surpassing value of knowing Christ Jesus my Lord, for whom I have suffered the loss of all things, and count them but rubbish so that I may gain Christ (Phil. 3:8). Nothing matters but Jesus. In Christ alone, I stand. Christ gave His life for us (justification) as that we might be found in Him, not having a righteous of our own derived from the Law, but that which is through faith in Christ, the righteousness which comes form God on the basis of faith (Phil. 3:9). He now lives His life through and we are progressively changed into His image (sanctification) by the power of His resurrection and the fellowship of His sufferings, being conformed to His death (Phi. 3:10). See Galatians 2:20. One day He will take us to heaven (glorification) where we will attain to the resurrection from the dead (Phil. 3:11). No other call to consecration can compare with Paul’s evaluation of Christ. Should we be able to grasp the truth of this text, the lure of the world, the lies of the devil, and the lust of the flesh would fade from our conscious state. The things of this world will grow strangely dim in the light of His glory and grace! And, oh the joy!! Irrepressible, unexplainable, uncontainable Joy in the Journey! To watch live video stream of this message,click here. The message is live on Thursday, March 26, 2006 at 10:45 CT and then archived at www.bellevue.org under MOMS Spring 2009 "Joy in the Journey". We will soon be posting podcasts of this series on this blog. Blessings. I am a grandmother, and frankly, I make no apologies. This Works For Me. When the baby grands visit, time stands still. Agendas are put on the back burner. Schedules are suspended. Phone calls are not taken. Twitters are ignored. Email sits in the inbox. Facebook spins in cyberspace without my input. For that time, I (and Craig, if he is home) am in the moment-lost in a world viewed from the floor. My boys are grown up. Raised and released into the adult world. Married and raising babies of their own. Gentle mommy reader, may I encourage you to stop more often to sit in the floor and play. Enjoy these moments. Although it does not seem like it if you have little ones, mothering has a shelf-life. It is not a "forever job." It is a holy occupation, but it will come to an end when your children leave home. That day is coming . . . and sooner than you would believe. Don't let the moments of joyful play pass you by because of a long "to-do" list. These moments are evaporating and they cannot be regathered. My philosophy when my boys were young - "I am raising boys into men. I am not raising a house." A house can wait. A boy will not! I am not suggesting that you are slothful or careless with your home and other responsiblities. I AM saying that keeping a "perfect" house (or any other time consuming task) is a sad tradeoff for impacting your children with your faith and values. Faith is much more easily transferred to the next generation through the day to day moments - as we live out the reality of the life of Jesus Christ in us. When we walk by the way. When we rise up. When we lay down (See Deut 6). As we go. We share Jesus. Casually. Faithfully. Prayerfully. The window of time when children are teachable is short. Don't waste it. Play often. Pray always. This Works For Me. Consider my words carefully and see if it Works For You too. For more Works For Me, click here to go to We Are That Family. Blessings. As a Christian mom, I quickly discovered the presence of an internal tension as I was training up my boys in the way they should go. I was forced to come to grips with the awesome responsibility God had entrusted me in the spiritual training of my children. Not only was I responsible for the physical well-being, the social development, and the intellectual training of my offspring, but above all things I wanted to see them come to know Jesus as Lord and Savior and walk in His ways all the days of their lives. This desire to give my children a hunger for the things of God led me to study God's Word. I was desperate to know Him in order to influence my children for the cause of Christ. I knew I could not believe FOR them. That would be a personal decision between them and the Lord. My role was to live the reality of my faith and trust in the contagious nature of a life infused with Jesus Christ. My lifeline became the Book of Proverbs. Every day I read a chapter of Proverbs. With 31 chapters, in a month's time I could make my way through the book. At the end of the month I started the process over again. Over and over again, i soaked in God's wisdom scripted in the Book of Proverbs. Proverbs is uniquely written as a collection of God's precepts and principles for living a lift that honors Him. My advise for raising children is to saturate your soul with the Word of God and surrender yourself to His Spirit in obedience, confidently trusting in Him to do the work in your life and in the lives of your children that only He can do. My buddy, Wendy, is hosting Multiple Kid Mondays. Click here to read more and add your thoughts on your blog and blog along with us! Blessings. My boys are grown, married and have babies of their own. Raising them was great fun and now, watching them build their own household of faith is the greatest joy of my live. John wrote, I have no greater joy than to know my children walk in faith. Amen to that! My perspective on parenting from the rear-view mirror has given me a unique perspective. Here are 5 things I wish I had known when they were small. 1. That the best parts of their personalities, those things I particularly loved about them when they were small, would remain in tact and become amplified in their adult life. 2. The manners I spent so much time teaching them would stick and become a natural part of their lives. 3. They would eat a wide variety of foods, including vegetables. All those years of cooking and coaxing, "Try it. You'll like it. It's good for you" finally paid off. 4. They would learn to sit still. When they were little guys, I would have never believed either one of them could sit still for a minute. 5. They could walk through a doorway without jumping up to touch the wall above the molding - although I confess, I do miss seeing their hand-prints on the walls! I wish I had known these things when my boys were young. It would have saved me some agony and grief. Next week I am going to host a carnival and invite you to add your 5 Things to my list. Each week will be a different topic of 5 Things. Please join me. Blessings. Paul’s undeniable faith was validated by his irrefutable testimony. Paul’s joy was not manufactured. It was not pretense or performance. It was not dependant on circumstance. Paul’s joy was genuine. Outrageous. Outlandish. Unspeakable joy. Deeply rooted in his relationship with Jesus Christ, the joy of the Lord was Paul’s strength (Neh. 8:10). About joy, Paul wrote it is a safeguard for you (Phil. 3:1). A Sanctuary. Nothing places us out of the grasp of the enemy’s reach quite like the joy of the Lord. When the joy bells are ringing in the soul, the heart soars to the presence of the Lord seated in the heavenlies. The eyes are fixed on Jesus, the author and finisher of the faith. The mind is renewed. The will is surrendered. The behavior is transformed. Joy flows out of the inner most being. In Colossians 3:16-17 Paul wrote, Let the word of Christ richly dwell within you, with all wisdom teaching and admonishing one another with psalms and hymns and spiritual sons, singing with thankfulness in your hearts to God. Whatever you do in word or deed, do all in the name of the Lord Jesus, giving thanks through Him to God the Father (Col. 3:16-17). Regardless of circumstances, Jesus is ruling and reigning. The sooner we realize we are not in control and have never been, the sooner we will relinquish the need to control our circumstances and relinquish ourselves to Him. This attitude in living produces a heightened sense to the move of God in our lives. As we develop an awareness of His presence and a hunger for the restoration He provides, we are progressively changed. The spiritual discipline of renewing our mind combined with the desire to walk in obedience and dependence produces a practice that reflects our position in Christ. The end produce is outrageous JOY. Rejoice in the Lord. It is a safeguard for you. There is Joy in the Journey! One sure joy-stealer is unbelievers who are intent on wrecking havoc among God’s people. While some unbelievers live by a lofty moral code, content with the pursuit of self-righteousness, others have set their face against God and His people. We can gather from Paul’s epistles that the early church was being troubled by false teachers, many of whom planted themselves inside the church. They feigned conversion in order to divide and destroy the body of Christ from within the church. Paul called them dogs, evil workers. In Paul’s day dogs roamed in packs and were regarded as dangerous mongrels, rending, tearing, and devouring. God refers to His people as sheep. Dogs disturb and destroy sheep. Beware of these evil men. The word translated “evil” literally means depraved, bad. Beware. A renewed mind that can rightly divide the truth is the best defense against false teachers. Paul referred to these unbelieving agitators as members of the false circumcision. The Bible forbids any type of heathenistic cutting of the flash (Lev. 21:5; I Kings 18:28) which is most vividly seen in the story of Elijah. The prophets of Baal cut themselves in a religious ritual of Baal worship. Paul regarded the Jewish ordinance of circumcision, when demanded of Gentile converts by Jewish zealots, to be no better than a heathenistic cutting of the flesh. Circumcision had come to distinguish the Jews from the Gentiles. It was an outward symbol for the nation of Israel that represented her unique covenant relationship with God. It was never intended to become a condition of salvation. Since salvation is wrought by the finished work of Christ on the cross, the insistence by some to add the rite of circumcision as a condition for genuine conversion nullified the grace of our Lord Jesus Christ. And frankly, it sickened Paul. To add the requirement of circumcision in order to be converted put the ritual in the same category as the heathen’s practice of cutting the flesh as an act of their worship. Paul denounced the practice and warned his readers to beware of the false circumcision. For any to preach the so-called addition of works of any kind to the once-for-all-time Sacrifice for sin, was to deny the sufficiency of the cross. Christ and the finished work of the cross is the basis for our worship. We worship in the Spirit of God and glory in Christ Jesus (Phil. 3:3). In John 4:24 Jesus said, “God is spirit, and those who worship Him must worship in spirit and truth.” And for all who have met God on His terms of faith and repentance, there is Joy in the Journey! The Judaizers were deluded into thinking righteousness could be achieved through works of the flesh. In Romans 3:28 Paul wrote, For we maintain that a man is justified by faith apart from the works of the Law. Religious activity, no matter how sincerely believed and sacrificially followed, is never a substitute for righteousness. God created man to be inhabited by God. Indwelling the human spirit, the Holy Spirit had access to the soul (the mind, the will, and the emotions). When Adam sinned, the Holy Spirit vacated the human spirit and man was left with a sin principle in control of his soul – teaching his mind, controlling his emotions, directing his will and ultimately determining his behavior. This principle of indwelling sin is referred to as the flesh (Rom. 7). At conversion, we are given the power to crucify the flesh and walk in the Spirit. However, this is not automatically achieved in the Christian life. Apart from the renewing of the mind and the conscious surrendering the will in obedience to the Spirit of God, it will never be realized. Paul wrote, Lay aside the old self, which is being corrupted in accordance with the lust of deceit, and that you be renewed in the spirit of your mind and put on the new self, which in the likeness of God has been created in righteousness and holiness of the truth (Eph. 4:22-24). Put off the sinful habit patterns of the old man, which is corrupted by the flesh, trained in depravity prior to conversion. Put on the new man, which is progressively being formed in you by the righteousness of Christ. Do not attempt to control your flesh with the flesh. Do not put any confidence in the flesh. Do not attempt to reform the flesh. View it as your enemy. Crucify it. Exalt Christ and live to His honor and glory. And beloved, have Joy in the Journey! Outrageous. Outlandish. Unspeakable joy. Unshakable joy. Undeniable joy. Unparalleled joy. In the midst of your circumstances, joy. Joy in the Journey!